AMC was infected by a zombie bite and now it can't get rid of The Walking Dead. It officially took two episodes for AMC to realize that bringing back The Walking Dead for a second season would be a good idea. After the series premiere was massive for the network, and the second episode aired to a similar success this past Sunday, AMC has ordered another lineup of brand new episodes. 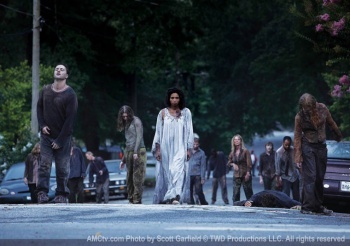 Fox International Channels also aired The Walking Dead in Europe, Latin America, Asia and the Middle East last week and it was the highest-rated original series premiere to air simultaneously on FIC worldwide. "No other cable series has ever attracted as many Adults 18-49 as The Walking Dead," AMC president Charlie Collier said. "This reaffirms viewers' hunger for [brains]." Okay, he actually said "for premium television on basic cable," but I think brains fits better in this case. The second season of The Walking Dead will consist of 13 episodes, 7 more than the show's fairly short first season. "I wish all programming decisions were no brainers like this one," FIC's Sharon Tal Yguado said of the series' continuation. I'm not sure if they're trying to go for zombie references here, but I'd like to think so. She also said that FIC wants "at least 10 seasons." An air date for Walking Dead's second season wasn't announced. The UK's Dead Set, which recently aired on the Independent Film Channel in the U.S., may have brought zombies to television first, but The Walking Dead feels like it's on a different level of production. If the storyline ends up being similar to the Robert Kirkman comic book of the same name, it should kick into high gear once the show establishes itself and its main characters. For as long as they're alive anyway, because there's really no such thing as a safe character in the world of The Walking Dead. Believe me, someone you like will probably die in season 2. The Walking Dead airs Sundays on AMC at 10PM EST.